Yesterday at a book signing for my new book, Sunday Roasts, I offered samples of Golden Cider-Roasted Turkey mounded on baguette slices, topped with spoonfuls of glistening Cranberry and Dried Cherry Chutney. Those who stopped by all commented on the moistness of the turkey, but what really caught their eye and their palate was the deep crimson chutney. One woman told me that she had not been pleased with her cranberry sauce the previous year, and was eager to try this chutney. I’ve included this special condiment more than once in my Thanksgiving classes, and each time it turned out to be one of the most popular dishes on the menu. Everyone loves the balance of flavors—the sweetness of the cherries countered by the tartness of the cranberries. If you’re still looking for a great complement to your bird, give this chutney a try. It takes about 10 minutes to prepare and can be made several days ahead. Store it in the fridge, and at serving time mound it in a bowl. Then watch your family and friends reach for seconds! In a medium, heavy saucepan combine 1 cup water and the granulated sugar and set over medium-high heat. Stir until the sugar has dissolved, and then bring the mixture to a boil without stirring. This entry was posted in blogspot, cranberry chutney, dried cherries, Thanksgiving, turkey side, turkey tips and tagged chutney, cranberry, dried cherry chutney, Thanksgiving by bloggerimport. Bookmark the permalink. 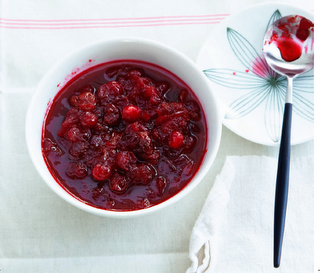 Your cranberry chutney sounds delicious and very easy to make. Mine is very similar to yours but also includes sauteed onion and celery. I like your recipe very much and will try it next Thanksgiving! 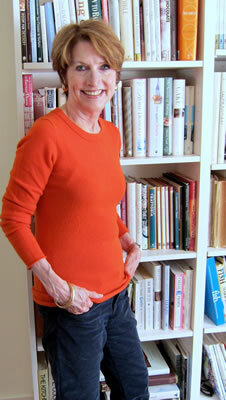 So happy to have discovered your blog and will look for your new cookbook. I love cooking and food blogs and will now be following yours!